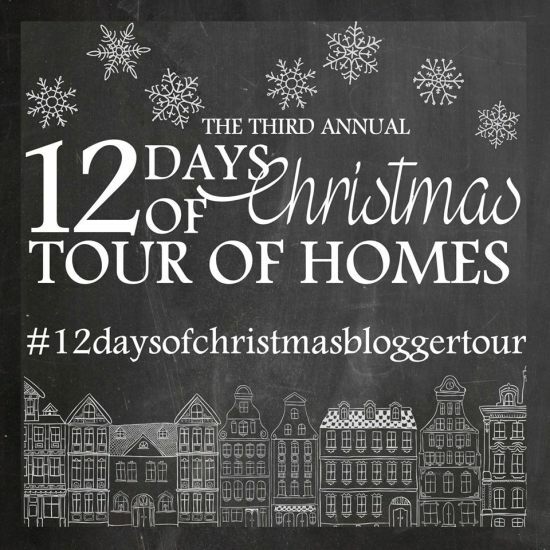 Welcome to Day 4 of the 12 Days of Christmas Tour of Homes! Today you will get a peek into our home at Christmas with our foyer, my office and our den. This year I chose pink and gold to compliment are already very colorful home. I did promise the Hubs that I would keep the bows on the outside of the house red. I think he was afraid I would hang big pink bows on all of our window wreaths. If only they made it in outdoor velvet. Come on in!! Our tree this year is outside my comfort zone, and yet the most perfect tree we have ever had! I was really struggling with the combination of balls to make it fit my pink and gold theme. Then I completely gave up and let the kids decorate it. As I watched them pick up each ornament I had just unwrapped it dawned on me that perfection when it comes to the family tree was just plain selfish and sad. This is OUR tree and should reflect our lives together. This years tree doesn't contain one colored ball or piece of garland. What it does contain, however, is our precious ornaments I have collected over the years that represent who we are as a family. And I couldn't be happier with it! His and Hers bourbon station. Both the hubs and I love to wind down with bourbon, he sips his and I mix mine. We also like two different kinds of bourbon. Can you spot my bottle? I hope you enjoyed the peek into our home this time of year. I love our home all dolled up for Christmas. Decorating just feels necessary to celebrate the best time of the year! Don't you think? A sneak into our kitchen and dining room ... come back next week to see more!! Check out the rest of the hostesses ... and come back on the 16th to link up your wonderful house! I can't wait to see inside each and every one of your homes!! Paige, no word of a lie, every time I read one of your posts I find myself SMILING. Your colorful and JOY FILLED home, your love of your life, it's such a delight to see and read! You are so fun to visit. Your Christmas home is so beautiful! I love your bright happy colors and little touches everywhere - the his & hers bourbon station is awesome, and the tree that your kiddos decorated! Enjoy it all!! everything is so festive and fun! i love the mantle with the 12 days of christmas lindsay letters prints- what a unique idea!!! Your home just exudes joy with your cheerful decor. Love the 12 days of Christmas on your mantle! I absolutely love your home!! I can't wait to see more of your beautiful christmas decor!! Paige, I love it!! The pops of pink are so perfect, and I'm having a hard time picking a favorite thing. I love how you used the Lindsay Letters printables - aren't they the cutest things ever? And your boxwood wreaths on your stairs - perfection. Thanks for participating in this year's tour!! Happy Almost Birthday! So many thoughtful touches. 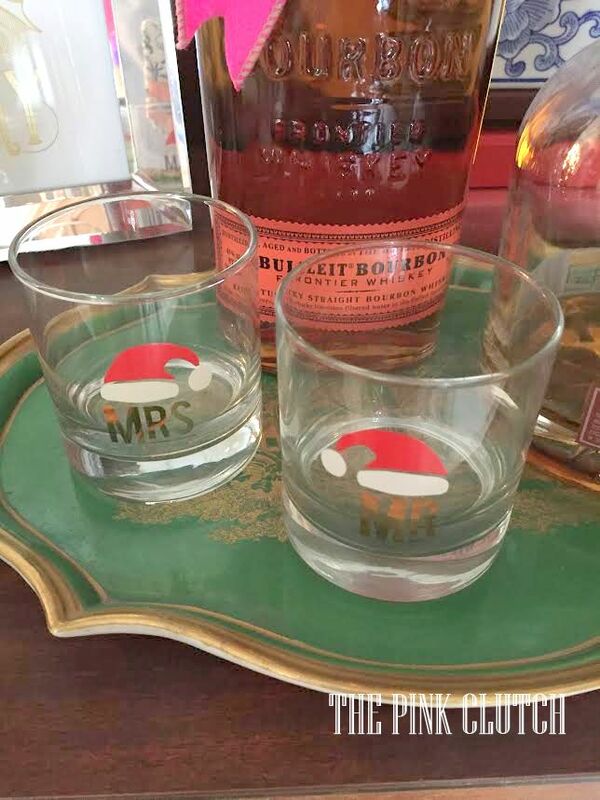 Love the Mr. and Mrs. cocktail glasses...and the wreaths on the stair banister. Merry Christmas. All so beautiful Paige! Love the pink and gold! Looks like we bought the same boxwood wreaths :) And our tree is the same and I love it that way. All the kids' handmade ornaments hang right next to our "fancy" ones. Loved being tour buddies today! Paige, thank you for capturing the essence of what Christmas is as a family...beautiful! Where did you get the Mr & Mrs Claus glasses? Oh Paige, that entry vignette is so fabulous!! If I didn't know you and were at your door and got a glimpse of it I would find a way to wiggle myself in to peek at the rest!! :) Every spot just oozes charm and joy! Wonderful job, can't wait to see the rest! 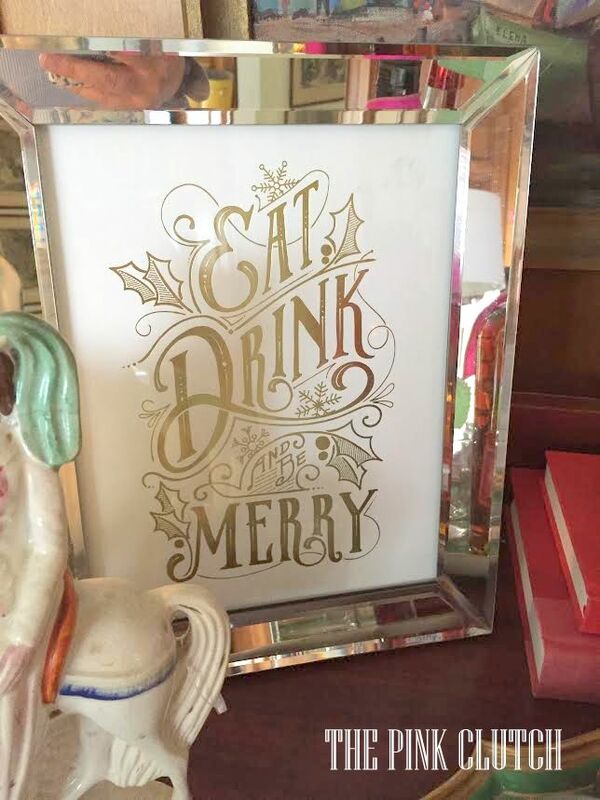 Paige, I adore how you incorporate vintage finds into your everyday and holiday decor - it oozes Christmas tradition with a twist (which I love!). And wow, your mantel and the way you used the 12 Days of Christmas cards is phenomenal. So glad to have you along on the tour and looking forward to seeing the rest of your home! Beautiful Paige! I love seeing a corner of that picture you bought from me!!! Merry Christmas! Love your 12 Days of Christmas! What size did you use for the mantel? Love it all Paige. Bright, fun and festive. So you!! Merry Christmas. Love all the cheerful colors! You have a beautiful Christmas style. Pink and Gold are two of my favorites- even better when paired together!